The event, hosted by radio personality Kirk “Big Boy” Alexander of Real 92.3 FM, was held to inaugurate the election of Villanueva, who beat former sheriff Jim McDonnell in a surprise upset in November’s election. It was the first time a challenger had defeated a sitting sheriff of LA County in more than a 100 years. Special guests included L. A. County’s Board of Supervisors, who endorsed the incumbent, ELAC president Marvin Martinez and former state senator Kevin De Leon. De Leon is the author of the widely controversial Senate Bill 54, The California Values Act known as the sanctuary state law. 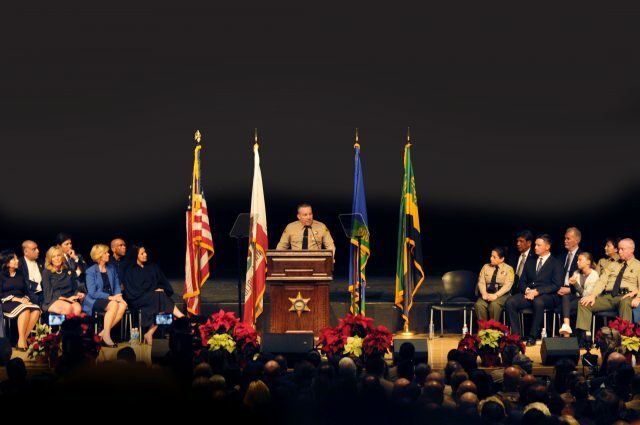 According to the LA County Sheriff’s Department website, Villanueva is now in charge of the largest sheriff’s department in the world with almost 10,000 deputies and more than 8,500 civilian personnel. Among the department’s responsibilities are the 42 cities and 153 unincorporated areas that make up LA County, including 22,000 inmates. “You all stood with us. That’s why I’m here today as a straight shooter who spoke truth to power and challenged establishment authority,” said Villanueva. Villanueva, who served in the United States Air Force until 1986, retired a lieutenant of the Sheriff’s Department after 32 years of service. During his tenure, he started the alternative deputies union, Los Angeles Sheriff’s Professional Association, because he wasn’t happy with the way the Association for Los Angeles County Deputy Sheriffs was doing business. He also stood up to former sheriff Lee Baca in 2005. In a lawsuit filed against the department Villanueva accused Baca of denying promotions to minorities and other forms of discrimination. During the event, Villanueva promoted chief Maria Gutierrez to assistant sheriff in charge of countywide operations, and captain Tim Murakami was promoted to assistant sheriff in charge of street patrols, reinforcing Villanueva’s push for diversity. Villanueva , who’s a Democrat, pledged to immediately fire more than a dozen top officials who were holdovers from the previous regime in a statement last week. “Yes the rumors are true. There is a new sheriff in town,” said Villanueva in closing.